I have never cried through a blog post before, but this year, I've buried five childhood friends: Vince Flynn, Andrew Greeley, Tom Clancy, Sheamus Heaney and Elizabeth Peters. Yes, it's strange to say that some of my best friends were writers that I've never met, but you must consider a few things. I've been reading these people for a very long time, and they've lasted longer than every relationship I've ever had, sans family. Sheamus Heaney's Beowulf is the first and best translation I've ever seen of the epic poem. It was smooth and easy to read, and was just plain straight English. He died in his 80s, with a few international awards, so he had nothing to regret when he left. 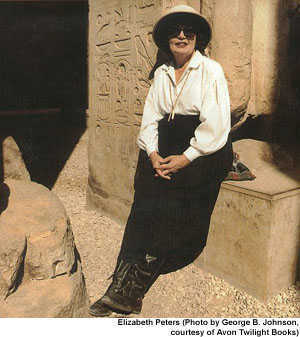 Elizabeth Peters, aka Barbara Mertz, introduced me to Egyptology the old fashioned way -- by writing about murders at Egypt excavation sites. There was a reason I was a child who knew an awful lot about the Egyptian pharaoh Akanten. Her characters were witty, well drawn, and brilliantly done, even though none of them were particularly handsome. It was smart writing with intelligent heroes and villains, and enough history to make it interesting without making it painful. I will never see the rest of the family of archaeologists she created, who grew up with me -- the only offspring of this Nick and Nora of the desert was my age, and aged at almost the same exact rate. She died at age 85. She had a damned good life, and I will miss her. It just hurts when a childhood friend has died. Tom Clancy was my bus ride home every day during Freshman year of high school. When the film Patriot Games came out, it was one of the first movies my father loved so much I just had to get it for him immediately. Jack Ryan was fun, because he was a nerd who had to be an action hero whether he liked it or not. After I played SSN, a submarine game based on an idea of his, the Spratley Islands and the South China Sea were never the same. Splinter Cell brought me back into the world of gaming by showing me an interesting story with my games. I probably learned more about history from Tom Clancy than I did from any history class in high school. When 9-11 happened, my first thought was "Didn't Tom Clancy do this already?" When he died, he was only in his 60s. Not fair. Vince Flynn .... I've discussed Flynn's writing other places. He was a fun author, who only used politics when it suited his plot, which was most of the time. Not bad for a thriller author who spent most of his writing time using terrorists for target practice. His first book about CIA assassin named Mitch Rapp was about terrorists taking over the white house. This was before terrorists became popular (1999), and he did a wonderful critique of what went wrong during the 1990s in the intelligence world. One of the nice things about Vince Flynn was that he always has a domestic element to his novels. Domestic as in "do we have to kill the politicians before they get us all killed." Again, Flynn has had politicians as antagonists since the 1990s, so he didn't jump on a Tea Party bandwagon. He helped write the best season of 24, day 5, which started with a bang, a boom, and a massive shootout in the first episode. he was a good, solid author. And he was only 47, damnit. And then there was Fr. Andrew Greeley, who was with me the longest. Greeley wrote mysteries, and romances, and even one or two thrillers of his own. A Catholic priest from Chicago, I grew up with him in the house. I read his novel Angel Fire when I was 12, one of those books that you start at night and finish by dawn. I probably learned more about my faith from Greeley than I did from 12 years of Catholic school. He was essentially a childhood friend. Granted, he went off the rails a little when he hit the 21st century. As a Chicago Democrat, he went from little jabs of "being a Republican is a sin, but excused by invincible ignorance" to just being snotty about his politics, which means he may have written about 15 lousy books..... I'd settle for having a few dozen bestsellers of quality writing. He was also 85, and I expected him to live forever.